The Soldiers Memorial Park and gates commemorate those who served in World War One. The gates at the entrance to the park contain the dedication plaques. 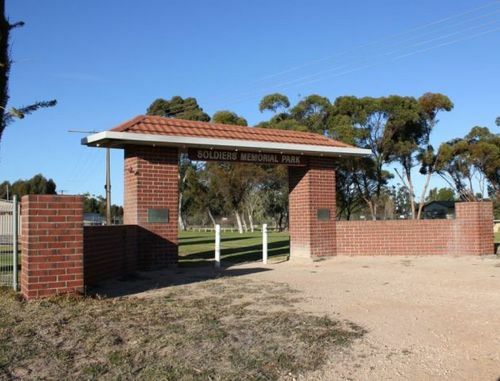 A large crowd gathered at the Pinnaroo Soldiers' Memorial Park yesterday for the dedication of the park and the opening of the new gates. The gates were erected as a result of efforts by a committee consisting of representatives of the district council, R.S.L, and sporting bodies connected with the park. The opening ceremony was presided over by Councillor J. S. Ferguson, the chairman of the Pinnaroo District Council and on the platform were the senior chaplain (Colonel G. W. Kendrew) Dr. L. J. Pellew, and Mr. H. A. Bakewell. Colonel Kendrew conducted the dedication service, and Dr. Pellew performed the ceremony of opening the gates by cutting a ribbon. Two minutes silence was then observed. The Advertiser (Adelaide), 24 September 1934.